The Findlay - Hancock County Community Foundation, the City of Findlay, and Hancock County combined resources to improve a public asset, Dorney Plaza. Situated between the City of Findlay Municipal Building and the Hancock County Courthouse, the plaza was first built over 30 years ago. 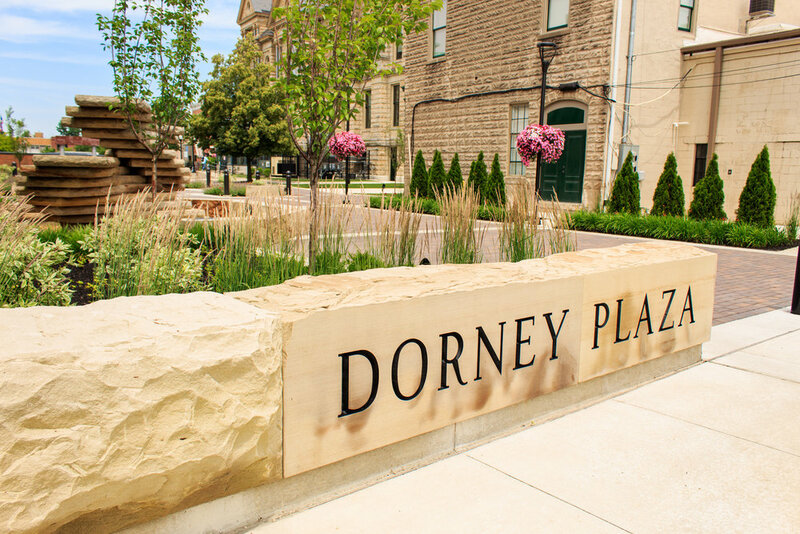 Named in honor of L. Dale Dorney; a quiet man who loved Findlay and left a $5 million bequest for improving civic life; a public venue in the heart of our community was a fitting tribute. Unfortunately, over the years, the plaza had fallen into disrepair. So in celebration of their 25th Anniversary, the Findlay - Hancock County Community Foundation led the fund-raising effort to rebuild the plaza. 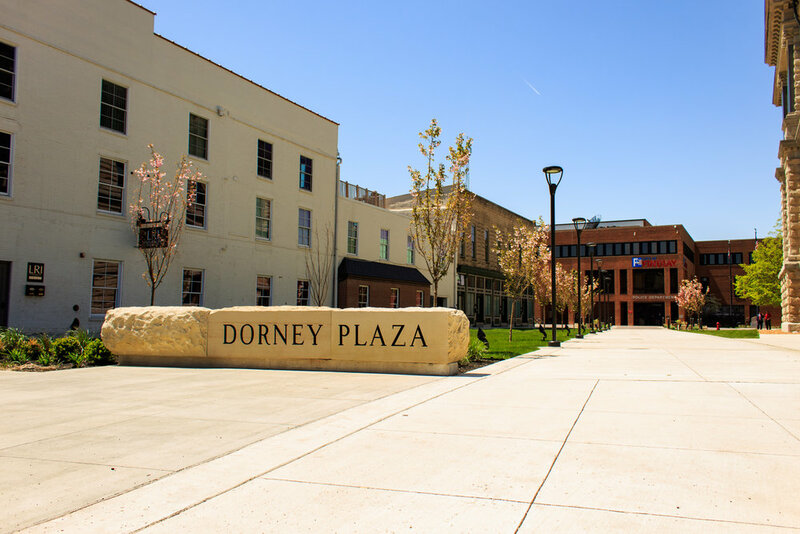 RCM Architects were asked to re-envision a new plaza, and one year later, Dorney Plaza has been enjoyed by a wide variety of citizens. Christmas celebrations, patriotic events, public rallies, and the everyday hustle and bustle of local government have made great use of this dynamic, urban space. The design of the plaza is a remembrance of the past, acknowledgement of the present and a nod to the future of our community. Acknowledging our present, 13 Kwanzan Japanese Cherry Trees are planted in honor of the long and lasting friendship between Findlay and Kawaguchi, Japan - Findlay's Sister City. 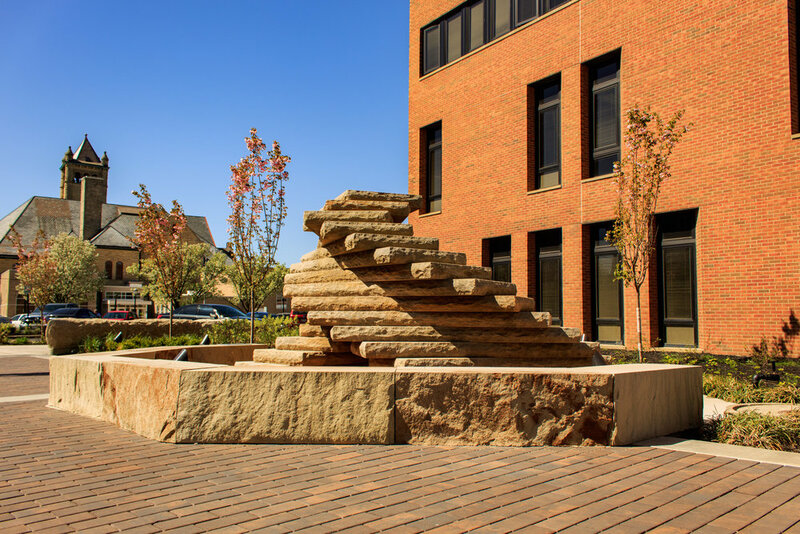 Honoring the past, stone benches surrounding "Chloe," and interspersed in the plaza, are from the same quarry that provided the original stone for the County Courthouse - built in 1888. In 2018, as our community celebrates our iconic Courthouse's 130 year birthday, RCM Architects are proud to have played a part in improving the central gathering space of our community. And being a neighbor to Dorney Plaza, we are able to witness the public enjoyment of this improved urban landscape.